This week, the Government of Canada announced that Viola Desmond (1914-1965) will be featured on the new ten dollar bill in 2018. Who is Viola Desmond? Here are some facts and resources to help you get to know her and her important story. In 1946, Viola Davis was a beautician in an age where few black women were accepted into beauty schools. She opened up the Desmond School of Beauty Culture in Halifax, NS and sold her line of hair and skin products across the province. On November 8, 1946, Desmond was traveling on business and had car troubles in New Glasgow. As a way of killing time while her car was repaired, she went to a movie at the Roseland Theatre. At the time, the Roseland was segregated and black patrons were not allowed to sit on the main floor. 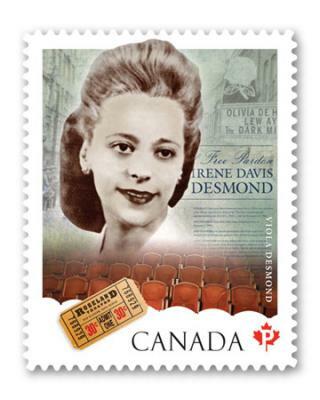 Viola Desmond tried to buy a ticket for the main floor so she could get a better view of the movie but was only allowed to buy a ticket for the balcony. She bought the balcony seat for a penny but decided to sit on the main floor. Theatre staff told her she would have to move and when she refused, the police were called and she was forcibly removed from the theatre and taken to jail where she remained for 12 hours. Ms Desmond was charged and convicted over the one cent difference between the balcony and main floor ticket prices and was fined 26$. Racial discrimination was never formally acknowledged in her lifetime. In 2010, Viola Desmond was granted a free pardon by the Province of Nova Scotia, thus acknowledging her innocence. Premier Darrell Dexter stated, "This is a historic day for us to recognize the courageous act of Viola Desmond." Other fascinating and important candidates for the 10 dollar bill include: E. Pauline Johnson/Tekahionwake (1861-1913), Mohawk poet; Elsie MacGill (1905-1980); Bobbie Rosenfeld (1904-1969), Olympic athlete; and Idola Saint-Jean (1880-1945), Quebec suffragette.